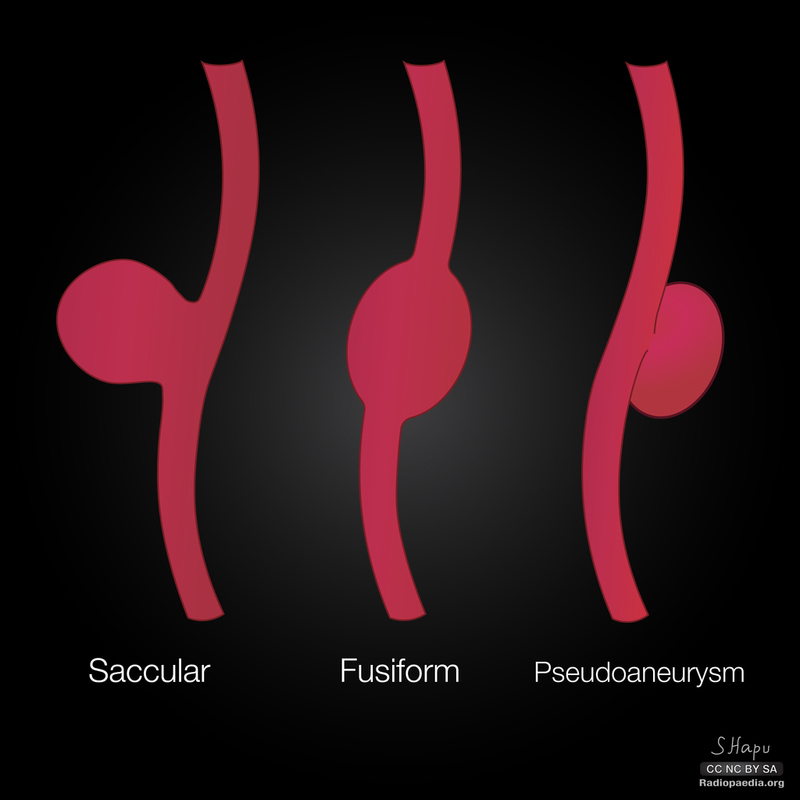 In a true aneurysm, the aneurysm is bound by all three layers of the vessel wall (intima, media and adventitia). The wall may be attenuated. The risk of rupture is proportional to the size of the aneurysm. An aneurysm is a bulging, weakened area in the wall of a blood vessel resulting in an abnormal widening or ballooning greater than 50% of the vessel's normal diameter (width). An aneurysm may occur in any blood vessel, but is most often seen in an artery rather than a vein. An aneurysm may be located in many areas of the body, such as blood vessels of the brain (cerebral aneurysm), the aorta (the largest artery in the body), the neck, the intestines, the kidney, the spleen, and the vessels in the legs (iliac, femoral, and popliteal aneurysms). The most common location of an aneurysm is the aorta, which carries oxygenated blood from the heart to the body. The thoracic aorta is the short segment of the aorta in the chest cavity. The abdominal aorta is the section of the aorta that runs through the abdomen. An aneurysm can be characterized by its location, shape, and cause. Computed tomography (CT or CAT) scan. This diagnostic imaging procedure uses a combination of X-rays and computer technology to produce horizontal, or axial, images (often called slices) of the body. A CT scan shows detailed images of any part of the body, including the bones, muscles, fat, and organs. CT scans are more detailed than standard X-rays. Magnetic resonance imaging (MRI). An MRI uses a combination of large magnets, radio frequencies, and a computer to produce detailed images of organs and structures within the body. Echocardiogram (echo). This procedure evaluates the structure and function of the heart by using sound waves recorded on an electronic sensor that produce a moving picture of the heart and heart valves. Arteriogram (angiogram). This is an X-ray image of the blood vessels used to evaluate various conditions, such as aneurysm, stenosis (narrowing of the blood vessel), or blockages. A dye (contrast) will be injected through a thin flexible tube placed in an artery. This dye will make the blood vessels visible on the X-ray. Ultrasound. An ultrasound uses high-frequency sound waves and a computer to create images of blood vessels, tissues, and organs. An ultrasound is used to view internal organs as they function, and to assess blood flow through various vessels. What is the treatment for aneurysms? Extent of the disease (location, size, and growth rate of the aneurysm). Routine ultrasound procedures. These procedures will monitor the size and rate of growth of the aneurysm every 6 months to 12 months as part of a "watchful waiting" approach for smaller aneurysms. Controlling or modifying risk factors. Steps such as quitting smoking, controlling blood sugar if diabetic, losing weight if overweight or obese, and controlling dietary fat intake may help to control the progression of the aneurysm. Medication. Medication can control factors such as hyperlipidemia (elevated levels of fats and cholesterol in the blood) and/or high blood pressure. Aneurysm open repair. An incision is made to directly visualize and repair the aneurysm. A cylinder-like tube called a graft may be used to repair the aneurysm. Grafts are made of various materials, such as Dacron (textile polyester synthetic graft) or polytetrafluoroethylene (PTFE, nontextile synthetic graft). This graft is sewn to the involved blood vessel, connecting 1 end of the artery at the site of the aneurysm to the other end. The open repair is considered the surgical standard for an abdominal aortic aneurysm repair. Endovascular aneurysm repair (EVAR). EVAR is a procedure that requires only small incisions in the groin along with the use of X-ray guidance and specially-designed instruments to repair the aneurysm. With the use of special endovascular instruments and X-ray images for guidance, a stent-graft is inserted via the femoral artery and advanced up into the aorta to the site of the aneurysm. A stent-graft is a long cylinder-like tube made of thin metal mesh framework (stent), while the graft is made of various materials, such as Dacron or PTFE. The graft material may cover the stent. The stent helps to hold the graft open and in place.